Thick, creamy and oh-so cheesy! 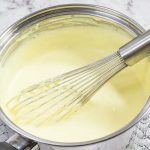 Our Ketogenic Cheesy Bechamel Sauce is one of those basic sauces that are so useful to have in your repertoire. In a saucepan, place the cream cheese, butter and heavy cream and place over low heat. Continue stirring until the cream cheese has melted and all ingredients are combined. Add the mozzarella cheese and whisk continuously until it is melted and fully combined. Use the sauce immediately, or store in the fridge. Reheat over low heat, whisking continuously.